WhatsApp is one of the most used messengers where you can share Audio, Contact, Documents and More along with Messages. WhatsApp has many hidden features that you may not be aware of. Sending GIF is one of those features. So here you will get to know How to Send GIF on WhatsApp on Any Smartphone. It works on both Android and iOS devices. The Graphics Interchange Format is short looming animated images without sound, typically used on the internet to convey a reaction. Popular in the web’s earlier days, the rise of social media has seen the humble GIF make a comeback. Twitter, Facebook, and iMessage now support them. You can tell people about your reaction with just one GIF. This may be the best way to show your reactions in messages on messaging Apps. Emoji are also a way to convey reactions, but they are different than GIF. Other than reaction we can also show feelings, mood to others using GIF. GIF can even bring a smile to someone’s face. The methods are different for Android and iOS devices to send GIF in WhatsApp. You can create your own GIF and send in WhatsApp. It is so easy these days to create a GIF, Because of tools that are available online and offline. Before coming to the topic How to Send GIF on WhatsApp, I want to let you know How to make GIF. OK. So now you know what a GIF is. But more importantly, how do you make a GIF? There is not one way to do it. Many software programs can take your images and video clips (right from YouTube) and make a GIF for you. Only one GIF can explain our emotions, feelings, thinking, reactions, Mood without typing a word. So if you don’t prefer replying to chats by writing like me, you can send GIF. Also, there are some cases when we can’t even show our emotions with words as GIF and Images do. In WhatsApp for Android, you have to go deep to see the GIF feature. As it is not available as an attachment like Document, contact, audio, Location, Gallery, and Camera. 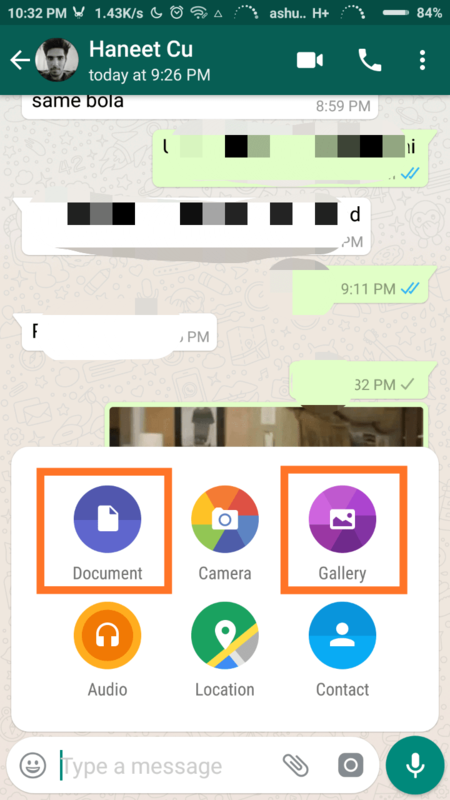 To send GIF in WhatsApp, you need to click on emoji icon that is available on the right side where we write messages. After that, you will see a GIF option on the bottom which is just at the side of an Emoji icon. Click on GIF option, and now you will see many GIF. Search for a specific GIF by clicking on search icon. At last, choose the GIF you want to send and then send it. In iOS, the process is different a bit than Android. But it is also simple as Android. In case of WhatsApp on iOS First tap on Plus icon “+” and then select Photo & Video Library. Then you will see a GIF option at the Bottom left, just tap on it. It will lead you to a page full of GIF, Choose a GIF or Search for a GIF. Select a GIF that you wish to send and Send it. What if you already have a GIF on your phone and you want to send it. Then you need to follow a different method. This time you don’t need to go to GIF option. Tap on Attach icon and select Gallery and the look for your own GIF and then send it. You can also send GIF from Document section, but Gallery could be a better option. Can we send a part of Video as a GIF? The answer Yes, we can send Video Clip as a GIF. But again the question arises how we can send Video Clip as GIF. The answer to this question is below. Remeber You can send any video as a GIF, only if the video is under six seconds. Under Gallery section select a video that you wish to send. Then resize or Trim the Video to the length you want, but it should be under 6 seconds. When you trim a video under six seconds the GIF option will occur, Tap on GIF option. And then send it. You have read How to Send GIF on WhatsApp on Any Smartphone. Stay connected to YTECHB for latest Tech News, Android & iOS Tricks, Telecom News, Accessories, Mobile Reviews and much more. Like our page on Facebook, Follow us on Twitter, and Subscribe our channel on YouTube @YTECHB. If you have any questions regarding How to Send GIF on WhatsApp on Any Smartphone, ask by using #YTECHB in the comment section.